Ventrice, now a freshman at Monmouth University, also was the epitome of unselfishness on the court, another attribute that will serve her well as a volunteer firefighter for Jefferson Township Company No. 2 and Long Branch Company No. 5. "This is the best decision I've made in my life," the 18-year-old Ventrice said. "I liked the idea of volunteering and enjoy physically and mentally demanding things." Her desire to serve her community led Ventrice to attend the Morris County Fire Training Academy during the summer of 2013. Training was held for four weeks, Monday through Friday, from 8 a.m. to 5 p.m. and included classroom and practical sessions. She was one of five women enrolled in the classes. It was a blazing hot summer, with temperatures ranging between 90 and 100 degrees. The humidity was insignificant compared to the live burns that sent the trainees into burning buildings that were 400 to 700 degrees. "We were in full gear with air packs," she recalled. "The PPE (personal protective equipment) is about 40 to 60 pounds. It was tough but I enjoyed every second of it." Among the drills was one in which a room was smoked out. Ventrice said she "couldn't see her hand in front of her face" and followed a rope through the course. The objective was to find a body, a dummy that weighed 160 pounds, in a room and bring it to safety. She performed the exercise with a partner, successfully retrieving the body from a bathtub. Fortunately, she is 5-foot-11 and fit. "I think sports, especially basketball, which I played since I could walk, helped prepare me for this," said Ventrice, a homeland security major at Monmouth. "You need to be in shape and have confidence. There's a lot of teamwork." MacDermid feels Ventrice's willingness to cooperate is one of her strengths. He noted that she was a fine passer. "Kait works really, really hard," MacDermid said. "She commands respect." Ventrice, who also participated in softball and track during high school, never put up big numbers while playing basketball. It was the little things - a tap, a steal, a rebound - that made a difference. Her positive attitude was another plus. John Todo, chief of Jefferson Township Company No. 2, is impressed by Ventrice, one of three women on the squad. "She's just a regular firefighter," Todo said. "Everyone just does their job. Kait is in good physical shape. That's important because the academy is rigorous. Kait is loving every second of this." 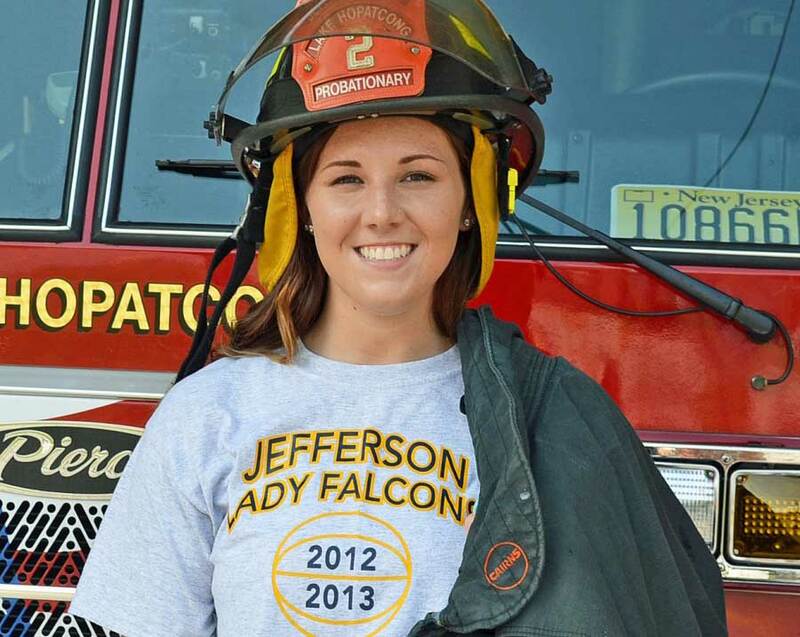 Initially, Ventrice's parents, Robert and Kathleen, didn't want her to become a firefighter. However, they fully support her, just like all of the men and women in her crew. "My parents were a little worried because it can be extremely dangerous," Ventrice said. "They're fine now. All of the guys treat me like I'm their daughter. I look up to them. We respect each other. We're one big family." Ventrice, a junior firefighter who will hold probationary status until she turns 19, doesn't have any specific duty for either company. She simply does what she is told. "The driver of the truck or an officer will say 'Grab this hose. Hit this hydrant,'" Ventrice said. "In Long Branch, there are seat assignments. They say hydrants or irons, which means axes or tools." On Saturday, Aug. 31, Ventrice left for college, where she will also answer the call via pager or cell phone. Long Branch employs paid firefighters but has volunteers as well. Ventrice hopes to play intramural basketball but Monmouth does not yet have a program. "I'm really going to miss it if I don't play but I think firefighting will keep me busy," said Ventrice.